Background: Persistent organochlorine compounds including Organochlorine Pesticides (OCPs) and Polychlorinated Biphenyls (PCBs) are one of the important components of chemical pollutants that enter into the Egyptian marine environment through different sources, more particularly from estuaries. Objective: The present study aimed to investigate concentrations of PCBs and pesticides in sediments and muscle tissues of Siganus rivulatus from El-Mex Bay and Marsa Matrouh areas. 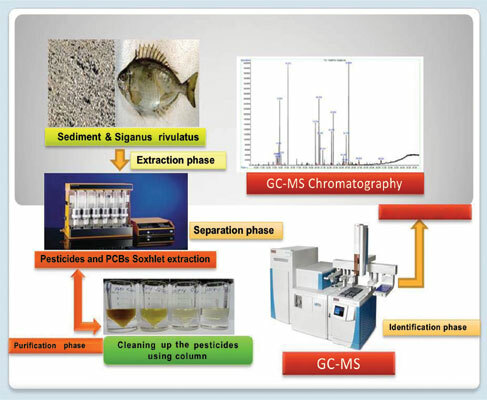 Methods: Sediment and fish samples were collected from El-Mex Bay of Alexandria and Matrouhcoast and transported to the laboratory for extraction and analysis by using GC-MS. Results: In general, concentrations range of PCBs and pesticides detected by GC-Ms in sediment samples revealed much more pollution in El-Mex Bay by PCBs and pesticides than Matrouh area. The present study indicated that concentrations of PCBs in sediments from El-Mex Bay were 9- fold more than those from Matrouh coast. Variations of pesticide concentrations in sediment samples were mainly due to the ongoing processes of adsorption/desorption and uptake by living organisms. In the meantime, the concentrations of PCBs in fish from El-Mex Bay were 11.5-fold more than those from Matrouh coast. Similarly, the concentrations of total pesticides in fish collected from El-Mex Bay were 7-fold more than those collected from Matrouh coast. Generally speaking, sediment samples had higher concentrations of PCBs and pesticides than fish samples reflecting its great capacity to absorb and accumulate such pollutants. The present study revealed also the presence of low concentrations of DDT metabolites and indicator PCBs in both areas. It reports important information regarding the presence of p,p’-DDE, p,p’- DDD, PCB 52 and PCB 153 in almost all fish samples from the two Egyptian coastal lagoons which are mainly due to a previous use of DDT in agricultural activity, high environmental persistence because of their chemical and thermal stability, different climatic environmental conditions, marine currents, different migratory and feeding habits of aquatic organisms. Conclusion: The results of the present study add new data about Organochlorine Pesticides (OCPs) and Polychlorinated Biphenyls (PCBs) to the global database about the contamination of the Egyptian marine environment and provide valuable information for regulatory actions. Therefore, the aim of this work is to determine the distribution and concentrations of PCBs and pesticide s in sediments and fish from two Egyptian coastal areas along the Mediterranean. One of the main important objectives is to compare the obtained results with data reported worldwide to evaluate the suitability of the Egyptian marine environment along the Mediterranean Sea for recreation and also the suitability of fish for continuous human consumption by the Public. PCBs, pesticides, sediments, Siganus rivulatus, Egyptian Mediterranean Coast, OCPs.